Although the arrival of HPAI H5 viruses of Eurasian origin to North America during the winter and spring of 2014-14 was a surprise, it wasn’t completely unexpected. For more than a decade the USGS and the U.S. Fish and Wildlife Service in Alaska have worked to test and track bird migrations and the avian influenza viruses they carry. 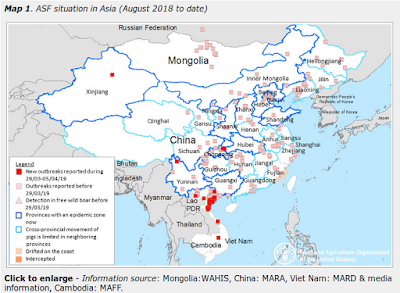 Eight years ago in USGS: Genetic Evidence Of The Movement Of Avian Influenza Viruses From Asia To North America, we saw evidence that suggested migratory birds play a larger role in intercontinental spread of avian influenza viruses than previously thought. In 2010, in Where The Wild Duck Goes, we looked at a USGS program that used Satellite Tracking To Reveal How Wild Birds May Spread Avian Flu. 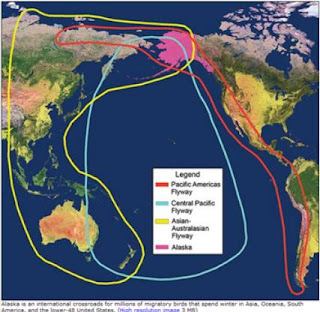 As the map at the top shows, the Pacific Americas Flyway meets up with both the Central Pacific and (more importantly) the Asian-Australian Flyways over Alaska and Siberia. Primarily north-south migratory routes, these flyways all overlap, and therefore allow for lateral (east-west) movement of birds as well. 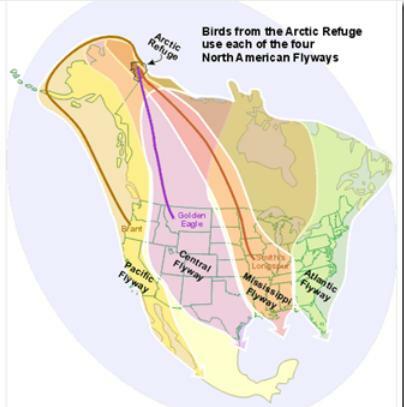 Our own Arctic Refuge, where more than 200 bird species spend their summers, serves as a central hub, and funnels migratory birds south via all four North American Flyways. While HPAI virus have not yet been documented in Alaska, based on genetic similarities to the Asian H5N8 virus, it is believed that last winter's arrival of HPAI H5 came from birds that migrated through Alaska. Today the USGS has published a press release to go along with a study, just published in the Virology Journal, on wild bird surveillance in Alaska during the spring of 2015. While they haven't yet found evidence of HPAI in Alaska, and they only found a low incidence of LPAI viruses, they did find some additional evidence of genetic mixing of North American LPAI viruses with Asian varieties. First some excerpts from the USGS press release, then a link to the study. ANCHORAGE, Alaska — The U.S. Geological Survey released additional evidence that western Alaska remains a hot spot for avian influenza to enter North America. The new report announces that while no highly pathogenic avian influenza viruses have been found in Alaska, the state remains an important area to monitor due to migratory bird flyways from North America and Eurasia that overlap the region. The designation of low or highly pathogenic avian influenza refers to the potential for these viruses to cause disease or kill chickens. The designation of “low pathogenic" or “highly pathogenic" does not refer to how infectious the viruses may be to humans, other mammals or other species of birds. Most strains of avian influenza are not highly pathogenic and cause few signs of disease in infected wild birds. However, in poultry, some low-pathogenic strains can mutate into highly pathogenic avian influenza strains that cause contagious and severe illness or death among poultry, and sometimes among wild birds as well. Last year, the USGS published an article describing the introduction of highly pathogenic avian influenza into North America at the end of 2014, likely via migratory birds that migrated through Alaska. However, highly pathogenic avian influenza was never documented in Alaska. The highly pathogenic viruses spread throughout parts of the western and Midwestern U.S., impacting approximately 50 million poultry. However, those highly pathogenic viruses have now not been detected in North America since July 2015. This fall, the USGS will sample wild birds at Izembek National Wildlife Refuge. Most of those samples will come from sport hunters.